We have a couple staple food item in the fridge at all times. I find we eat healthiest if we have quick meals already prepared. I’d much rather grab something fresh and homemade than eat out if we are in a hurry. Usually Sundays and Wednesdays are my days to make sure all our staples are freshly stocked. Sometimes I’ll use them as a side for dinner if I didn’t have time to prepare a full meal, other times I’ll add them to Ryan’s lunch or eat them myself of course! I found a set of stacked bowls in 4 sizes from Costco last year and absolutely love them. They always contain the same things in our fridge. My brother and sister in law bought us another set we asked for for Christmas so I use one at all times and have the other either in our trailer or use it for leftovers, etc. I always have one full of quinoa. I love quinoa and it’s great because it can be eaten cold or warmed up. Another key thing we have is the salad below. I love this salad because it’s so simple to prepare and is super filling. It affectionately has been named the garbage salad because I can basically add any extra veggies from the week’s dinners inside it if they need to be used up! I’m always munching on it and there is nothing bad about it! 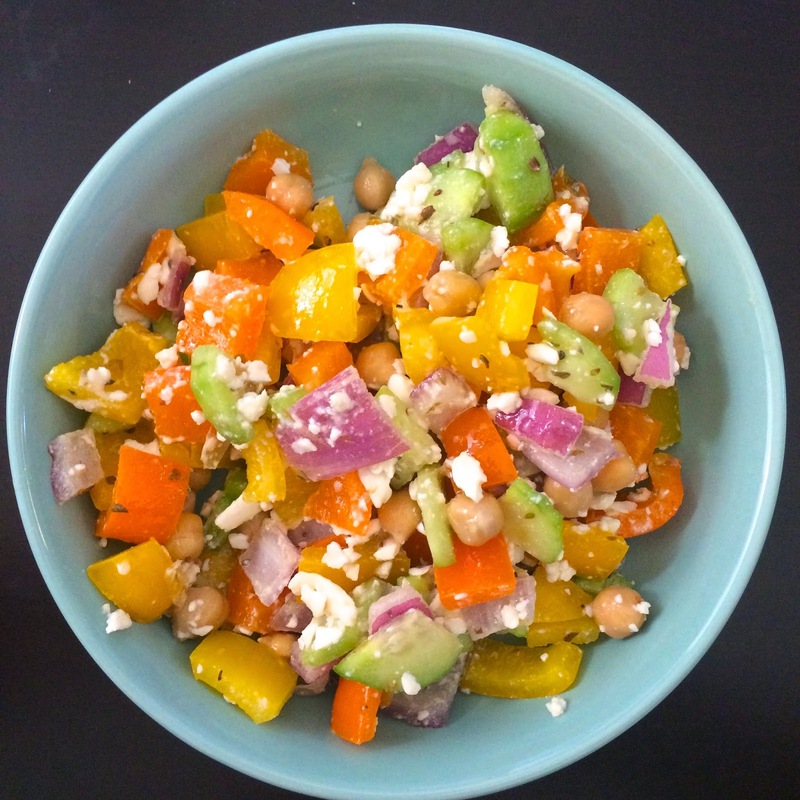 I sometimes add feta in but even still this salad is super healthy and delicious. It’s also husband approved! Disclaimer: I make this salad in a large quantity because I want it to last us a few days. If you want less, just adjust the recipe, as you desire. This salad doesn’t last long in our house, but it will keep for at least 4 days in a container depending on the freshness of the veggies being used. 1. 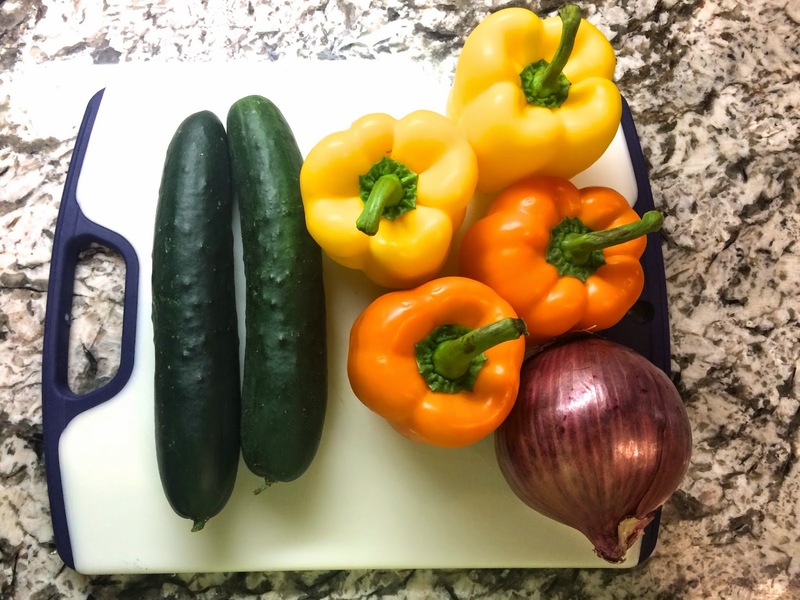 Chop all your veggies into about equal sizes and toss in a salad bowl. Add beans and feta. 2. Add a splash of red wine vinegar and olive oil so veggies look slightly coated. You want enough to taste but you don’t want the salad to look too wet or have any liquid sitting at the bottom of the bowl. The salad won’t keep as well. 3. Sprinkle with oregano to taste. Add a pinch of salt. * I also like to add olives, artichoke hearts, or tomatoes if I need to use it up from another recipe or if I’m just being a little fancy! 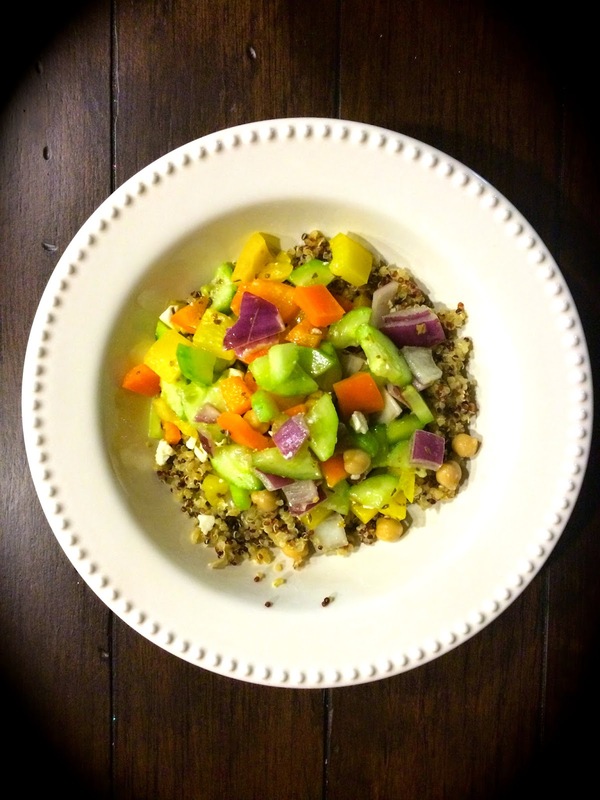 This salad tasted amazing with quinoa for a little added substance.